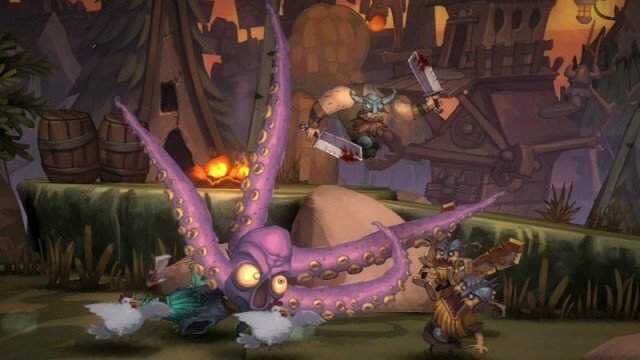 The occasional groan-worthy joke and technical hiccup may turn some off, but underneath those issues, Zombie Vikings is a mechanically solid and visually vibrant throwback brawler. Somehow, despite being in the public eye for the last several years, people still kind of love zombies. The Walking Dead is one of the most popular shows on television, while survival horror title Dying Light enjoyed strong sales earlier this year. And if the popularity of the History channel show Vikings is any indication, the general public is starting to come around on the Norse hell raisers as well. So, theoretically, now is as good as time as any to combine the two very different subjects. Apparently Zoink! also agreed with my genius line of thinking, as their latest effort, Zombie Vikings, is the unexpected mash-up of the two. Borrowing from popular aspects of Norse mythology, Zombie Vikings is very similar in tone to the last release from Zoink! : Stick It To The Man! We begin by seeing Odin, here portrayed as a crazed loon, having his good eye stolen from him by the mischievous Loki, who is less Tom Hiddleston and more hipster. With the rest of the gods unable or unwilling to help him, Odin must call upon the titular undead warriors. After being resurrected, Gunborg, Seagurd, Hedgy and Caw-kaa (and later another character) set out in search of the missing eye, even if Odin is promising them little in return. In case you couldn’t tell by the eye ripping and narcissistic Norse gods, this is far from a serious tale. Written by Zach Weinersmith (Saturday Morning Breakfast Cereal Comics), there was something of a scattershot approach when it came to the story. There are just so many jokes thrown at you that it can feel like there was no editing at times. Don’t get me wrong, there are plenty of jokes here that land hard. However, there are more than a handful of groan-worthy gags that will induce more eyerolls than chuckles. Even with all of the bad jokes, though, the meat of the plot is fun enough that it makes the bad jokes worth suffering through. Gunborg and company get the opportunity to interact with several interesting figures, and every main zombie gets their own unique characteristics and backstories. 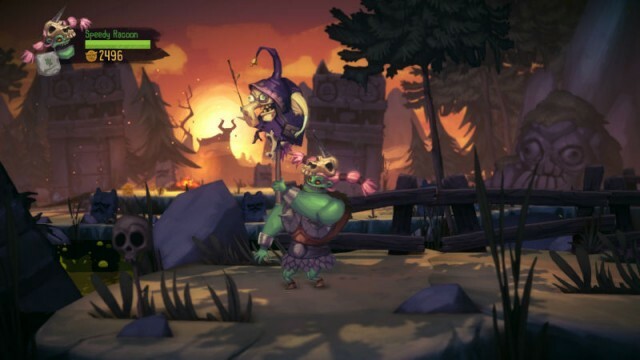 Pulling from classic titles such as Final Fight and Streets of Rage, Zombie Vikings is a traditional arcade-style brawler. You move across a 2D plane, occasionally jumping, while also beating up tons and tons and tons of enemies. If you’ve ever played a title of a similar style, you should have a good idea of what you’re getting here. Thankfully, each of the four characters feature their own strengths and powers, which helps switch things up. For example, Gunborg can hulk up her muscles so much that they explode, which causes massive enemy damage, but also hurts you. For a less self-punishing attack, Seagurd can grab enemies with his tentacles and toss them about. You’re free to pick and choose from any of the characters, but Zoink! does force you to use specific characters if you are playing by yourself at certain plot points. To help make up for the no-frills gameplay, Zombie Vikings features a handful of ways for you to play to your strengths. Using the gold you find littered over each level, or by completing the optional side quests found on most levels, you can acquire new weapons and runes. Some of the weapons are merely cosmetic upgrades, such as the Icepick or Candy Cane Sword. However, other weapons have additional benefits besides looking unique. One siphons energy from any enemy you hit, while another, which is actually a mad cat on a stick, doles out extra damage. The runes are a little less creative, but are just as useful. I mostly stuck with the rune that granted my character extra health, but others may find a more useful one to experiment with. What will make or break the title for most gamers is if they can find friends to join in on the action. With a group of buddies, you can look past the vanilla gameplay in order to find the fun in simple brawling. One of the ways Zoink! is able to distract gamers from the repetitive nature of the genre is by making players not only work together, but also learn to look out for themselves. Gold isn’t split between the four, while the weapons granted for completing a side quest are only given to one player. You’ll need to be a little cutthroat in order to stake your claim as the best. With that said, I can still see others being disappointed by the lack of variety. Sure, there are a few unique levels that wildly differ from the basic game, but for the most part you are doing the same actions over and over again. It can begin to feel a little grating after a few hours, especially if you’re playing by yourself. The minisucle replay value, outside of a handful of arena levels, is a bit of a disappointment. However, perhaps I’m just easily swayed by the fact that I can eat brains and toss Vikings around like it ain’t no thing, because I was okay with what was featured here. Similar to the visual style seen in their last title, Zoink! infused Zombie Vikings with a strong cartoon-like appearance. Vibrant and colorful, the character models have a striking cardboard cut-out look that really comes alive thanks to some excellent animation. Each of the levels you journey across also feel unique from one another. It’s fun to look through each one in order to point out specific gross-out details. You can see that the studio put extra work into the world of the game, and that they really wanted players to feel like this a unique environment. However, there were a couple of technical issues that arose, despite the recent patch. While nowhere near as bad as the title played pre-patch, there were a few sections that were bogged down with some serious lag. Frequent graphical clipping also occurred, specifically with my boy Seagurd, whose tentacles were consistently phasing through the ground. It’s extremely noticeable, and one of the few times where once I noticed it happening, it almost took me completely out of the game. Perhaps Zoink! can fix it up with another patch? 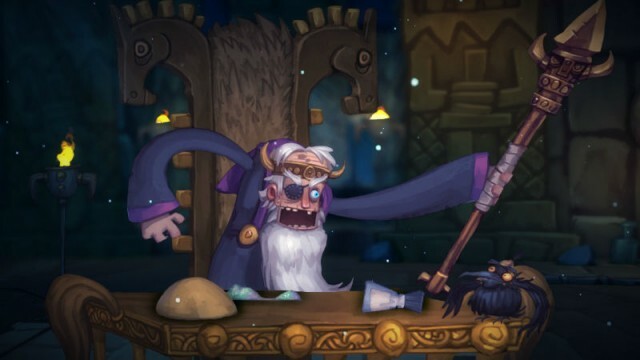 For those looking for a new title to enjoy with your friends over the course of a weekend, you can’t do much better than Zombie Vikings. Its combination of competitive and cooperative multiplayer is a blast, and it lasts just long enough to not overstay its welcome. The slightly grotesque visuals and scattershot humor may turn some off, but if you’re willing to look past that, there’s plenty of undead fun to be had. This review was based off the PlayStation 4 version of the title, which was provided to us. It’s currently available digitally, and a physical version will also be released in October.